On May 20, the moon passed between our planet and the sun. 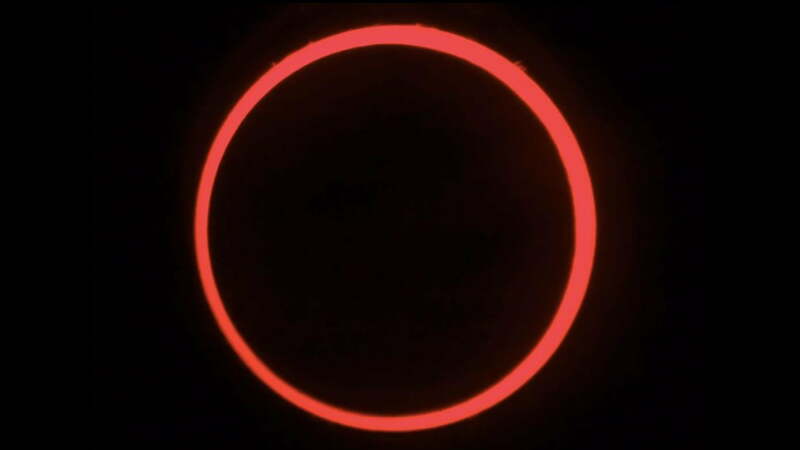 This particular eclipse was what’s known as an “annular eclipse” because, from the perspective of viewers on Earth, the moon’s diameter is apparently smaller than that of the sun, causing the giant fiery ball to appear as a burning, glowing halo around the moon at the height of the eclipse. It’s a gorgeous phenomenon, but as with all eclipses, it’s fleeting and to see the thing in the first place, you have to take special precautions, lest the event fry your retinas. In an effort to avoid blindness, Cory Poole (a science and math teacher in California), captured pictures of the event through a specially filtered telescope. He then took those images (all 700 of them), and created a time-lapse video that, while short, is both very pretty and one of those existential things that makes a person realize exactly how immense and awesome the universe is (or, if you’re a pessimist, how utterly insignificant we all are). Plus, when the red halo appears, the entire thing looks intensely ominous, like something out of an old Hammer Films movie designed to provide ambience for an unholy coven of surprisingly naked witches. This is a 60 second time-lapse video made from 700 individual frames through a Coronado Solar Max 60 Double Stacked Hydrogen Alpha Solar Telescope. The pictures were shot in Redding, CA, which was directly in the annular eclipse path. The filter on the telescope allows you to see the chromosphere which is a layer that contains solar prominences. The filter only allows light that is created when hydrogen atoms go from the 2nd excited state to the 1st excited state. What Poole fails to mention is that this type of thing only happens every 18 years. The last annular solar eclipse of this kind happened on May 10, 1994, and the next won’t be seen until 2030. Do you know where you’ll be two decades from now? No? Then you should probably witness this thing while you still can. Hit “play” below.